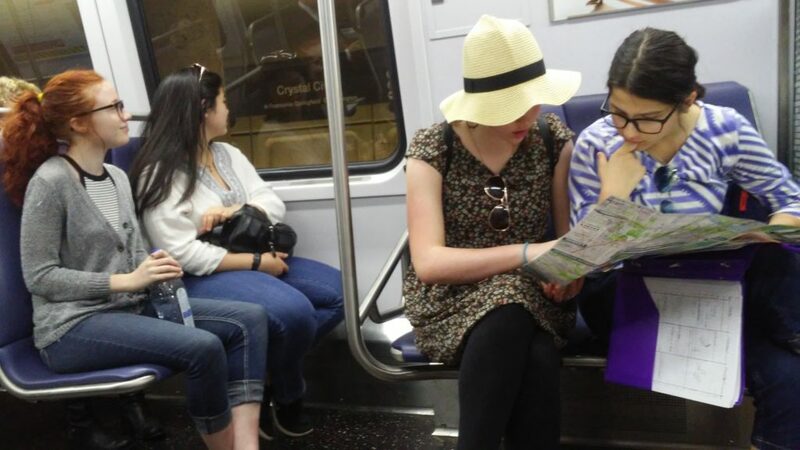 We, the WCEC high school class and two chaperones, hopped on the morning train out of Lynchburg and headed on an exciting trip to Washington D.C.
Students learning to maneuver D.C. public transportation; riding the Metro and reading the maps. Every four years, the senior high students and teachers plan a major field trip as an opportunity to have new experiences and expand their horizons. Our trip was made possible by the generous supporters of the WCEC, as much of the funds came through the annual Spring Fundraiser. We enjoyed three fun-filled days of exploring and learning from the museums and monuments, including a personal tour in the US capitol building. Throughout our trip to Washington D.C., we visited museums that had exhibits relating to what we had previously been studying in our Biology class. We spent most of our time in the ocean section of the museum where we reviewed topics like ocean acidification, animals and their environments, pollution, and the classification of animals. After we explored the deep sea, we went back in time to the origins of human evolution. We had the great experience of seeing models of the skull and body shape of our ancestors. We finished our trip to the Smithsonian Museum of Natural History with a dazzling array of many different types of gems and rocks. 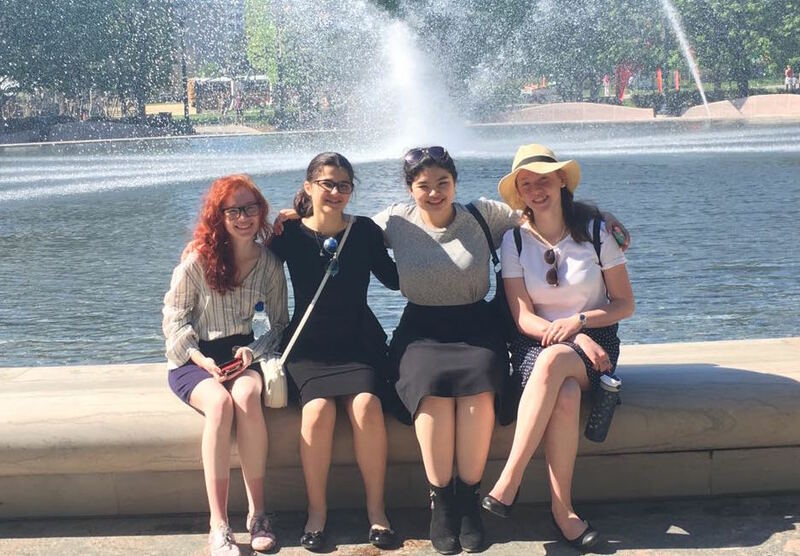 The high school students stop to rest their feet at the National Gallery of Art Sculpture Garden. We later visited the United States Botanic Gardens, the National Air and Space Museum, and the Library of Congress. At the Botanic Gardens, we got to experience plants living in different types of environments like Mediterranean and desert environments. Everyone enjoyed the natural beauty of the gardens. After the trip to the Botanic Gardens, we ventured over to the National Air and Space Museum. We viewed the history of the development of airplanes from the Wright brothers’ first airplane to the commercial airplanes we see today. Then we ended our visit to the museum with an out of this world experience watching a short movie held in a planetarium. At the Library of Congress, we learned about the fascinating meanings behind the architecture inside the building and then traveled down a road to the past through the experiences of World War I. The highlight of the trip was the opportunity attended the awards ceremony for Legacy International’s Emerging Young Leaders Award (EYLA) at the US Department of State. 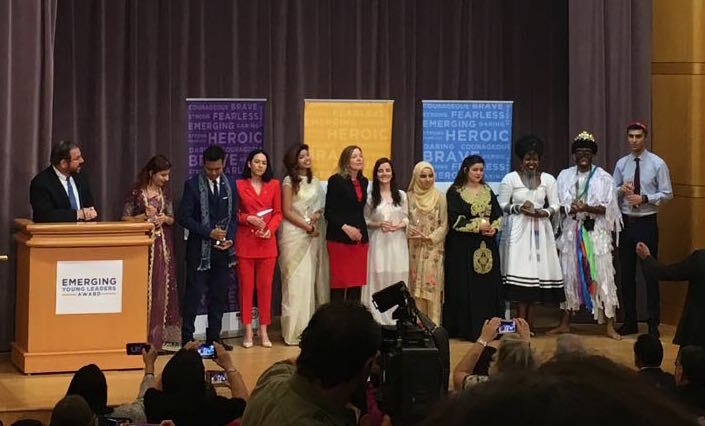 Students and teachers alike were inspired by meeting these amazing young leaders from around the world, who have been recognized for the large-scale positive impacts on their communities and the world. The Emerging Young Leaders Award and Exchange Program (EYLA) is run by the US Department of State. Ten individuals from around the world are chosen because of their work to positively change their societies. 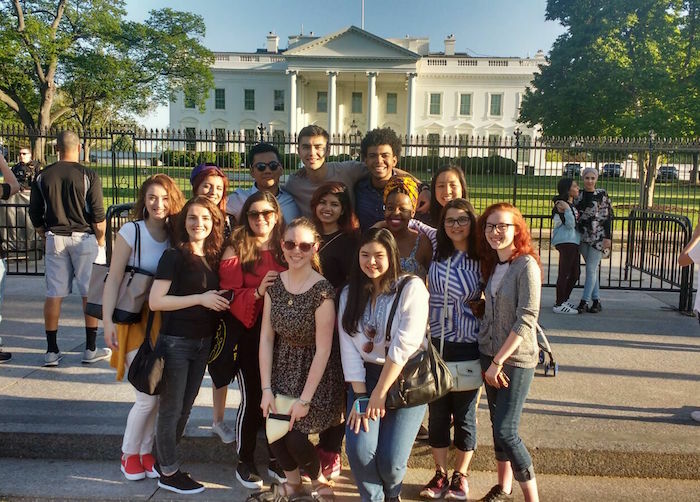 They come to the United States for two weeks, traveling to Washington D.C. to receive their awards, Austin, Texas, where they meet with their American counterparts, and then back to Washington to share project plans. We had the opportunity to attend the award ceremony at the Department of State. Having many connections with Legacy International and its’ programs, we were able to have one-on-one time with the Emerging Young Leaders while on a bus tour of the capitol. In between the historical information about Washington D.C., we were able to sneak in personal conversations about the leader’s work, countries, and other fun facts about them. We were even able to practice our Spanish with José Rodríguez, from Panama (though we were a little rustier than Señora Deanna would have liked). Being able to see these amazing young people in a light that shows they are still people like the rest of us, was what really made all that they have accomplished so incredible and maybe even realistic for the leaders within us all. Emerging Young Leaders with Assistant Secretary for Educational and Cultural Affairs, Marie Royce, some in their countries’ traditional dress. At the Emerging Young Leaders Awards Ceremony, we watched as these ten recipients received their awards and were interviewed about their work. After learning about their work, and having been able to get to know them a little the night before, the people on stage had personalities and aspirations, and it made the ceremony feel very real. This was one of the central parts of the trip in our planning, so it was nice to go and witness an acknowledgement of their hard work to help their communities. 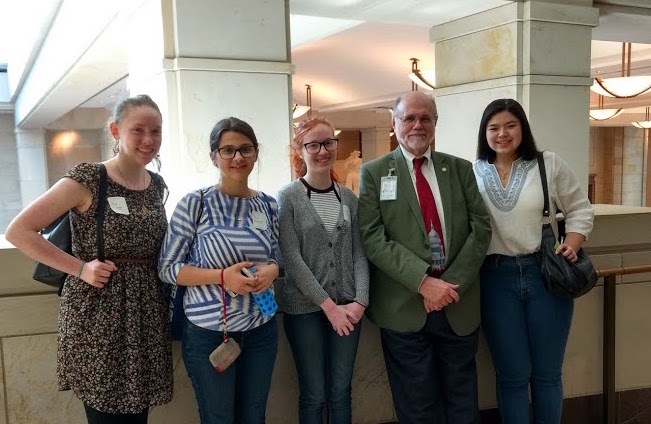 Students thank Steve Livengood, the US Capitol Historical Society’s chief guide, for giving them a wonderful Capitol tour. Also on our trip, we had several opportunities to see a side of D.C. that many don’t get. With the help of our incredible tour guides throughout, we were able to dive deep into American history and immerse ourselves in D.C. life. Our tour of the U.S. Capitol building is a perfect example of that. Lead by Steve Livengood, lead tour guide, we received a special private tour Mr. Livengood loved his job dearly and it was apparent in how he showed the Capitol and spoke about its’ history. We had the opportunity of seeing all the original wings of the capitol building including; the original Supreme Court, the old Senate Hearing room, and the original entrance that could never allow for all those who visit today to enter now. Not only did we get to walk through the historic halls but we were able to sit in the house chambers and walk by the offices of the senate and house incumbents. We are so incredibly grateful to everyone that donated to the Spring Fundraiser and made our trip possible. We are also thankful for Legacy International. Without their connections, and willingness to share those connections, many of our experiences would not have been possible. Through our own explorations of history, witnessing a drive for social justice, and a crash course on city living life skills, we feel that we’ve benefitted from our trip and hope that other classes in the future are able to experience the same feelings.